US foreign policy planners think about (and plan for) “hinges of history;” events and developments that alter the course of human events. Some events and developments are newsworthy and interesting, but ultimately unimportant (think: Libya). Some truly do turn the history of the world in a different direction (think: the collapse of the Soviet Union). The key to successful policy planning is to stay focused on those events that alter history’s path. There are three such hinges of history turning now: the nuclearization of Iran. the possible collapse of the Kingdom in Saudi Arabia and the apparent disintegration of the Pakistani government. Any one of these events changes the strategic landscape overnight. All three at the same time would destabilize some very basic tenants of US foreign policy. Of these, the most immediate concern (arguably) is the nuclearization of Iran. A nuclear Iran would lead almost immediately to a nuclear Saudi Arabia and a nuclear Egypt. Thereafter, as many as six states in the Middle East might have nuclear weapons. Nukes plus volatility is a bad combination on any given day. Nukes plus volatility multiplied by six Arab states and one Israeli nation is asking for very serious trouble indeed. 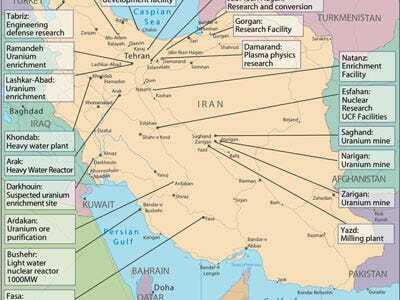 “This follows work carried out by Iranian engineers to map out uranium deposits in Africa and assess the amount of uranium they contain,” said the two-page intelligence summary. The report — confirmed independently by an official from another IAEA country — was shared as an Iranian delegation led by the head of the Cooperative Ministry Abbas Johari was meeting yesterday with “agriculture and mining interests” in the Zimbabwean capital Harare.